While known for his 35 years as an actor in more than 50 films and several television shows, Kiefer Sutherland has added country musician to his list of accomplishments. But, don’t think Sutherland is just playing around when it comes to the music business. The second-generation actor is prepping for his second tour in support of his upcoming album. The Reckless Tour will stop in St. Louis on Thursday, April 12 at Delmar Hall. It will be just the second stop on the nationwide tour. While preparing to head out on the road, Sutherland took some time to speak to ReviewStl’s Jeremy Housewright. I know you’re getting ready to head out on the tour in a few days. How has prepping for the tour been going? It’s been going really well. We played about 250 shows off the first album, so it’s really nice for us to hear the second record and play some new songs. I’m really excited for the show in St. Louis. Last time you were in town you played The Fubar and this time you’ll be playing Delmar Hall one of the newer venues in town. What can fans expect from your show this time around? Well, I think you don’t want to stray too far from what’s been set in motion. You’re going to get 10 new songs. Over the last two years we’ve figured out ways to make the show bigger. The thing that matters to me the most and that mattered on the past tour, is that these songs are really personal. What I like about my experience with audiences is that the things that I’m writing about are pretty broad, whether it’s the loss of love or the loss of someone in one’s life, or falling in love. There’s a pretty broad scope. I think this is a way to take a personal story that might be mine and have it really impact someone in the audience who has maybe had a very similar experience. That’s one of the goals is to be able to connect on a more much more intimate, personal level with an audienxe while having a show that can have really great lighting and energy. So, that’s what we’re going for. The one thing I noticed about your music when I first started listening to it is how honest and human the writing comes across. When you come up with an idea for a song, is it just something that pops in your head or do you go somewhere to write? I wish I was the guy who got up at 9 a.m. like Jackson Brown who gets up at 9 a.m. and sits down at the piano and starts writing. I could never do that. I tried and it just doesn’t work for me. I’ll give you an example, there’s a song on the record called “This Is How It’s Done.” It’s about literally from the first time I walked into a bar when I was a kid with some guy I was doing a play with all the way til now and my experience in that world. I was in a bar in Kentucky waiting for my band to show up and we were going to play a show opening for Stevie Nicks and their plane was late. I just started looking around this bar and saw something that reminded me of something else so I just wrote down a couple lines and just started writing. But, it’s usually something visual that will trigger a memory or a thought and then a line will come. I’ll just follow that line until I find another one and see what kind of melody comes. So, it’s not as organized as I would like, but I still manage to write quite alot. Is there a date when the new album will be released? I’m hoping towards the middle to end of April, atleast for it to be online and available. I can’ say for certain when it will be in stores but certainly on line it should be available. Did you feel any pressure writing the second album after the success of the first one? It kind of all blurred into one. I think alot of this album was dictated to be like “gosh I wish I had another uptempo song for the show tonight.” So, I would write one. Then I thought this might be a nice spot for a song at this part of the show. This really meant to me, what I wanted to a accomplish with our shows and with our touring. I’m always aware of what I’m looking for in terms of the perfect set list. For me, I tend to get like 7 songs that I’m really happy with and then start a record that really focused on those 7 songs and then I’ll have like 3 or 4 more songs to like. As far as acting, directing, or singing goes, is there one that you prefer over the other? I had to try to figure out within myself what the common denominator is for me and it really comes down to storytelling. As an actor for 35 years and hopefully til the day I die, I have loved working with a group of actors and a director and writet to figure out how we are going to tell this story. I find the same thing with the band going on stage with an album except you do it in a very different way. My learning curve for music is exponentially higher now because I have not done it as long. It will be inherentl more nerve wracking and more exciting and all of that. In regards to directing, it’s the same thing. It all comes down to the same roots and I like to tell a story and that’s been a passion of mine since I was a very young person. So, to try and say I like one more than the other is hard because to me they are all the same thing, but there is a visceral reaction I get from a live show and touring that I don’t get anywhere else. That is one of the things, and I’ll be honest, which has been one of the great joys and the thing that I look for every year. So I’m very excited to go out again. With making the record, out of all the experiences, that is the one thing I was not expecting to matter to me the way it does, and it matters to me in a very important way . Have you noticed, when touring, that you may get some fans coming out who are skeptical of your music at first and then after listening to you leave as fans of your music? Well, I can’ speak for the last part, but for the first part I can absolutely say yes. I would say almost all of them, at the beginning, were coming out to see the greatest car wreck of all time. It’s our job to take it from being a car wreck and turning it into a great race and we certainly work very hard to do that. More people are coming to the shows, so I think on one level we’ve accomplished that. I would never want to speak for an audience, but I can tell you our shows are getting bigger everytime so that’s what we work for. I was brought up being raised by my father to listen to the Conway Twitty’s, Merle Haggard’s, Johnny Cash type country music and I feel like yours is a throw back to those to them. It is. I talk about Johnny Cash and what he meant to me at my show along with Merle Haggard, Kris Kristoferson, Willie Nelson and all of those guys. They all told stories that had beginnings, middles and ends in their songs which is something that I related to as a writer. They also wrote stories that were not necessarily flattering about themselves, but man, was I ever grateful to hear that Mearle Haggard may have been struggling with some of the same things I was struggling with. You know what I mean? And, I felt that there was a fine honestly in their music that I really didn’t find anywhere else. What was your experience like getting to play the President? Well, I have to tell you, I play a president who is trying to figure it out as he goes. That was a little bit of a break. The character was not an elected president or any of that, but I have to tell you, we had a perfect set or the Oval Office, literally to the square inch. There was a funny thing that happened when I walked off the set the first time. I stood a little straighter, I sat a little straighter, I spoke more clearly. It has a profound impact. I think we’ve all been innodatted with images of the Oval Office over the course of our lifetime that it demands a kind of respect. I was thrilled by that. Does it give you more of an insight to maybe what the president goes through on a daily basis? Um, that didn’t. Preparing for it did. When I was preparing for the role, Barack Obama was still president, and I through a couple different people, managed to get a look into four days into the life of the president and his schedule. I was just floored that President Obama was working 14 hours a day, nonstop. I was incredibly impressed by the severity of the workload. Are there any country artists out right now that you would like to work with? There are so many. I was a huge fan of Chris Stapleton’s record, “Traveller.” There were so many last year. I’m in Nashville right now. I think you knew that. Walk down Broadway and stick your head in any juke joint and you will see amazing players doing their thing. I sat with a bunch of them but the list is too long to go through. Again, when I heard someone like Christ Stapleton, who took country music, which was the first type of Americana music, and the African American answer to that was blues. For him to still kind of live in the roots between the two, especially with that voice, that’s just someone who is incredible. What is it like to get to play The Grand Old Opry? Is that a true honor for someone who plays country music in your eyes? Absolutely, it is. At Opryland, they have a circle carved out from The Ryman Theater from back in 1971, going all the way back to the beginning of the Opry in the early 1900s. I remember I was standing outside of the circle and one of the musicians from the Opryland band said to go ahead and step in it, so I did. It was like stepping in a time piece. To be invited to play there was an absolute honor. 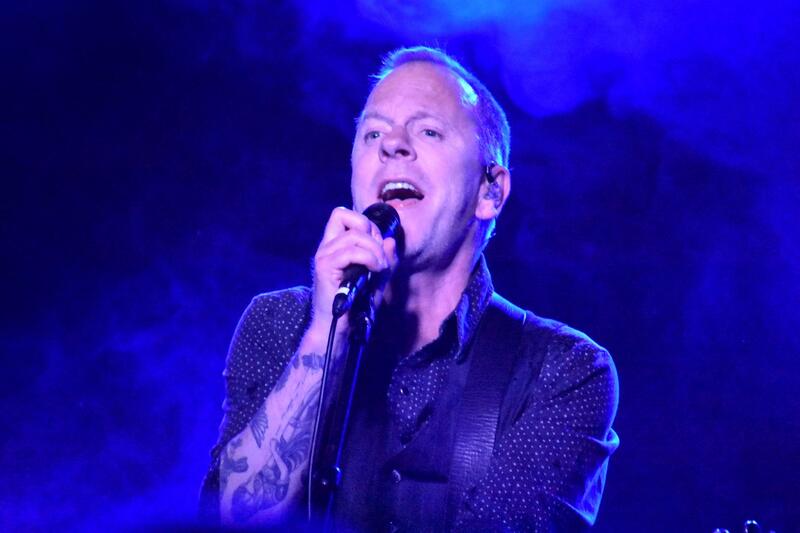 Tickets are still available for Kiefer Sutherland’s show at Delmar Hall on Thursday, April 12. Visit ThePageant.com for more information.